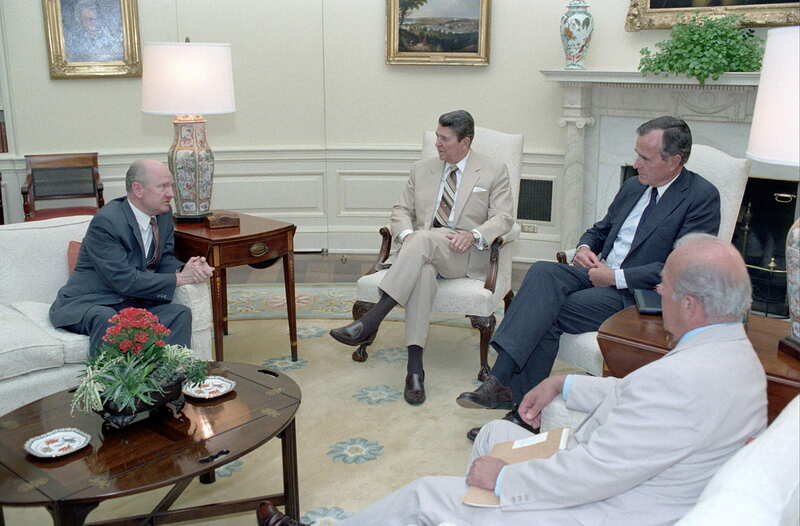 Gaston Sigur (left) in the Oval Office briefing President Ronald Reagan, Vice President George H.W. Bush, and Secretary of State George Shultz on the South Korean crisis in June 1987. The Sigur Center for Asian Studies was founded in September 1991 at The George Washington University and named in honor of Gaston J. Sigur, Jr., a long-time university professor and noted expert on Asia. Gaston Sigur received his Ph.D. in Japanese history in 1957 from the University of Michigan. He was then employed for many years with the Asia Foundation, with postings across the globe including Afghanistan, Japan, and Washington, D.C. He arrived at The George Washington University in 1972 to teach and direct the Institute for Sino-Soviet Studies. While serving in this position, Sigur wrote several major works on U.S. foreign policy in Asia and was a regular contributor to Orbis, a leading journal of world affairs. After more than a decade as director of the Institute of Sino-Soviet Studies, Sigur was tapped by President Ronald Reagan in July 1982 to become Senior Director of Asian Affairs on the National Security Council (NSC). Becoming the President’s close confidant, in June 1983 Sigur was appointed Special Assistant to the President for Asian Affairs. Athough Sigur briefly stepped out of public office in October 1984 to resume teaching responsibilities at George Washington University, he retained his close ties to the administration and acted as a consultant for the NSC. On January 24, 1986, Sigur was nominated by President Reagan as Assistant Secretary of State for East Asian and Pacific Affairs. In this position, Sigur is widely credited for having negotiated advantageous economic deals for the United States with Japan—even as he strengthened the overall US-Japan alliance—and for promoting the democratization of the Republic of Korea via his personal and forceful interaction with South Korean President Chun Doo-hwan. After the 1988 election, Sigur continued to serve as Assistant Secretary under President George H.W. Bush for one-year and continued to act an informal adviser for the President Bush even after stepping down from his official position in 1989. Sigur’s papers from his time in the NSC and State Department are available for consultation at the Ronald Reagan Library in Simi Valley, California. Sigur retired from public service in 1989 and promptly returned to George Washington University. Although Sigur wished to resume his active involvement with the Institute of Sino-Soviet Studies, his return was simultaneous with the 1989 revolutions in the communist world and the end of the Cold War. In light of the new geopolitical environment after the fall of the Berlin Wall, the George Washington University began to restructure its teaching and programming on Asia and Russia, eventually forming two separate institutes for the study of these regions. Recognizing Sigur’s contributions to Asian studies, The George Washington University, and public service, the university administration decided to name the new Center for East Asian Studies, established in September 1991, in his honor. Sigur was appointed Senior Counsellor of the Sigur Center, while Professor Young C. Kim was appointed founding director. William R. Johnson, professor of Chinese history, was made Associate Director. Following the retirement of Young C. Kim as Sigur Center director in 1996, the new director, David Shambaugh expanded the Center’s mission from East Asian Studies to Asian Studies. Subsequent directors have included Bruce Dickson (1998-2000), Mike Mochizuki (2001-2004), Kirk Larsen (2008), Shawn McHale (2005-2007, 2008-2011), Edward McCord (2011-2014), Bruce Dickson (2014-2016) and Benjamin Hopkins (2016 – present). Today, the Sigur Center coordinates the largest Asian Studies program in the Washington, DC metropolitan region, with a national and international reputation for its educational program and the quality of its academic and policy research.